Prof. Mwanawina is currently an Associate Professor of Law at the North-West University. He completed his doctoral studies on regional integration and international Law. 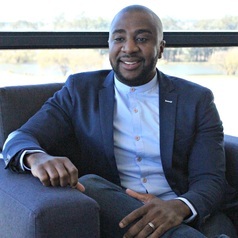 He is a receiver of various awards and recognitions including the NWU Institutional Teaching Excellence Award (ITEA) and the Excellence in Research Merit Award. Driven by his passion for an African renaissance, he continues to publish on topics related to regional integration, governance, and human rights. Prior to him joining academia, he has held various student leadership positions ranging from President of the Law Student Council, President of the Student Representative Council and Member of Council of the North-West University.